Hosts Stacey Harris and John Sumser discuss important news and topics in recruiting and HR technology. Listen live every Thursday or catch up on full episodes with transcriptions here. 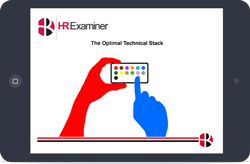 Good morning and welcome to HR Tech Weekly, one step closer with Stacey Harris and John Sumser. Good morning Stacey, how are you? Morning John I’m doing well. I am sitting in Charlotte not where I planned to be today but it’s a nice day and I am at least on the eastern coast away from the snow. I was in Minneapolis yesterday and trying to get out of Minneapolis with the snow. So I’m doing good today. You know I really like living in California because it doesn’t snow here. That’s like the primary thing to me. Yeah. I love to say, you know I’m from Ohio. I get snow but I was at a conference yesterday. I saw the snow start to come down about midway through the day and I’m just thinking April, soon to be May and the snow is coming down. So yeah, I was I was a little bit disheartening and then when the flights started canceling and they were talking about being stuck in Minneapolis for three days as much as I love Minneapolis. I took the first flight I could get getting out to the east coast and just that I will figure out a way to get home from there and that’s what I’m doing today. Yeah, just shuttling between hotel until I find another flight. Iwill be or I train one of the other and I’ll be home hopefully this evening though. But it’s not a bad you know it got me here. The weather is warm. This is very nice and I do hope everybody in Minneapolis stay safe and warm. People were making bets on whether or not they’d have school today. So our friends from the Minneapolis St. Paul area will probably let us know after the show if they had school today. Which is now called Fuel Works, so the Fuel Works organization had bought them but still basically four hundred five hundred organizations that sort of all come together and the Minneapolis St. Paul area. So there’s some fun stuff there that I can definitely talk about is what we’re learning and what we’re seeing there. There’s a lot of other stuff in the mailbag though I mean we definitely saw a interesting week. I wouldn’t say an overly busy week there is the depending on how you say it. Hi Bob. Hey Bob. The H.R. Technologies software which I’m kind of hearing a little bit about everywhere someone is talking about it. No I’m not sure if this receiving of 20 million in funding was the most recent. Unlike another version that we just talked about him a few weeks ago. So this may have been the same version of the 20 million but there was some updates about them receiving 20 more 20 million dollars more investments. But what caught my eye was the same time I also saw another conversation going on about an ex ADP executive Karen Hieran Hillman who joined Hi Bob as Vice President Sales and Operations. So I think again we’re just starting to see an organization that’s branding and building and probably should be paying attention to. It’s gotta be Hi Bob. Okay. Hi Bob! It’s a much more fun name I will say better than the other ones we’ve been hearing lately. Makes School which is a interesting organization is looking to add New York City campus after 15 million dollars in Series B fundraising. This is an organization that is partnering with businesses. So they’ve done a couple of things that I am a P E backed prison MHR buys Agilent turn now. These are for very very small organizations. The software itself from the H.R. perspective mostly for P E O’s but probably worth talking about covers eighty eight thousand companies even though they’re small. Two point two million employees. So we’re starting to see some consolidation in their air and then some fun stuff for you to talk about John. We’ve got data breach legislation proposing jail time for not just the ISOs but H.R. executives being proposed here in the United States. We have a Google Cloud CEO outlining his plans to take the firm even deeper into the enterprise which originally it feels like it’s just an infrastructure conversation. But if you read it you hear that it also is talking about the Google applications. I know you’ve been getting some insight into those with the Google which is or. Yeah that’s good. Could you maybe give us some insight is what that looks like. And then finally the European Commission announces a pilot program for A.I. ethics guidelines. I thought that was an interesting one knowing the stuff that we’ve been talking about. So a diverse and interesting week but maybe starting popping up at the top though just what we saw going on at the eleventh annual H.R. technology expo in St. Paul Minnesota. I spoke there giving a presentation on the H.R. technology basically the future of the H.R. technologist role. What is it. Are people going to be doing it. Are we going to see more of it had a packed room. Love the conversation. This is always a great audience. When I go to this event. But you and I were just talking a little bit about the fact that underlining theme of the entire event to me. That was great presentations by Southwest Airlines and Cargill and Oshkosh and General Mills and a lot of other groups in the area. The underlying theme that everybody kept coming up and talked to me about was where do I get the skills I need for this next generation of H.R. technologists. Where do I get the education I need for being an H.R. analytics person. Where do I get the background I need. And it seemed like every vendor I was talking to every session I went to they were talking about what someone needed to do. To work in the next generation of the workforce. So I thought that was kind of interesting and you were saying that that’s a theme you’re hearing as well and in a different way that right shoulder to shoulder first thing is not what we were talking about earlier. You’re generally a curriculum designer thinks about their world in the sense of repeatable behaviors that can be seen and basically evaluated that you have to have an objective basically that can be evaluated to build a course around it but all those goals that you’re sort of building courses around generally roll up into a curriculum topic right. So to me a lot of what you’re talking about are partially a mixture of soft skills which are very hard to evaluate and oftentimes instructional designers will even note that the evaluation for those soft skills aren’t as strong as they should be or they’re what you would consider curriculum categories which is basically a roll up of observable skill sets and things you’re training that when you can do all of these skill sets they’ll roll into something like critical thinking or team management you know those type of things right but they’re not in and of themselves a individual skill. That’s how I was thinking about it when you were talking about it. But I think it’s an open question and I think it’s part of the reason why we don’t have really good career modeling career passing tools. We have a constant battle with what is competency management in our world. Ryan. So here’s the kind of thing. The one thing about the way I think is probably trainable. And might be what is bent by critical thinking. So imagine it next year in your new matching tool in your recruiting department is up and running and I am the recruiter you’re the hiring manager. So I come to you and I say well. I’ve got this list of 10 candidates that the machine prepare and we’ve got 80 percent confidence that according to the machine we have 80 percent confidence that these are the right turn out of all that was raised that we receive. And I think we should interview them. But I do want you to know that the machine thing sits at 80 percent and we’ve been noticing it the failure start the performance is starting to degrade and so we’re not quite at the 80 percent that the machine says but we still have some confidence that these are the results. What I’m interested in as we go through the process is your feedback on where the machines right and the machines wrong and here are the areas that you might check as we go through these years. Right. That’s how you handle the new layers of complexity and data analysis is. In a conversation where you explain with the information that you have intent attempt to quantify your concerns about the machine’s assessment of the reality. Right. And that I think you can teach and I don’t know that critical thinking or not but it certainly involves some level of numeracy and some willingness to think beyond the output of the machine and that to me that still sounds very much I think there’s a series of different skill sets in there right. That would roll up into a topic or a skill area of critical thinking but. I think that might be part of the challenge is that organizations assume critical thinking is a single thing when in reality what you just talked about are probably six different skill sets in that one scenario. Right. You have to understand the machines understand how their algorithms work. You have to know enough about the business to be able to make some decisions about the level of accuracy. There there’s probably some knowledge that is necessary about sort of the group of people that the machine is making the decisions about to understand that as well as your companies requirements for diversity and inclusion or growth. All of those things would go into making that critical decision making process right. So I wish there was more clarity about what this office cost. Lots of people have to do the move I just described in lots of different settings you know. So the system shows from all of that the chemical feedback we can get that Stacey is three stars out of five performer. But what we’ve noticed is that when stress is on the team the job generally every time. That doesn’t seem to be her machine generated performance evaluation. But it’s the most important thing about Stacy is that when she’s on the team things happen better. Matt Stacy I would like to have on my team as well if possible examine examiner. If that doesn’t come across. Machine generated performance measurements. Yeah exactly. Yeah. Well and this is I think the challenge of where we’re heading is that machines feel like they should have the answer and we’ve talked about this many times right. And the skill sets that that we’re gonna have to develop as a workforce dealing with machines as part of our full sets that are giving us information and insight and answers and not just regurgitating information we put back into them is going to be all about our own knowledge to some extent it’s not going to be as much about our ability to understand that machine it’s gonna be about how much do we know so we can judge that machine right. That’s right. We’re going to have to supervise machines. And so I either never see that skill for instance are the skills you need in the future supervising machine should probably be on the list. So let’s talk about Hi Bob. Hi Bob. Hi Bob. Yeah. So this keeps coming up I’ve had it multiple times and someone asked me about it the other day. I haven’t had a chance to review them so they are on my list. Reach out to maybe get some time from briefing perspective. This 20 million dollars in funding is from investors Bessemer Venture Partners they’re located at a Televisa and tech platform it looks like they’ve got a whole list of all their query terms and plus applications. But what really sort of caught my eye is that you know they’ve been this high bar platform as talked about a rearranging and shifting the way people think about it your applications like every application does. But we are starting to see that some people who have worked in some of the other large organizations are moving to that organization. That’s usually a pretty good sign when someone jumps to that organization that it’s something that’s worth paying attention to. Right. So just one of the reasons why I sort of added it to our conversation list today. That’s interesting. So as I see the world GDP which is where people jump from services is the it’s like the two ball that makes all of the of the two bombs explode in the hard data payroll end of the business. So the thing that you’ve noticed here was the chair of Norman Jones here Bob as vice president of sales and operations. You don’t feel EVP to go to a startup unless there is a lot of weight there. But that’s how Ultimate Software drugstore is sales people running to a new exciting venture. So well we will probably hear more about Hey Bob I think giving Karen was at ATP for over five years and their innovation lab and client success area so I’m assuming that like you said if I don’t know Karen very well myself personally but I think it’s just an interesting note that we’re starting to see people sort of move in that direction and we’re probably paying attention to the next quarter’s big schools make school this is an area that I think you really like this area the idea of the school’s students you don’t have to pay for your education and to get a job. Yes I will have to say I think it when I see these stories I generally say Oh I think to me and maybe it’s because I did have a background in sort of recruiting in their early days with the third party recruiters and I thought it always felt to me like there was just so much value instead of having someone identify your worth in the market right. Helping sort of position you in a way that was beneficial for you. To me that’s what I see all these schools doing is that they’re basically taking a bet on you and then on their education right. And that’s an interesting perspective when you think about the students with two hundred three hundred thousand dollars in student loans right now we’re basically taking a bet on every university hoping they will get them the right position which just isn’t happening in the markets particularly here in the States but really around the world as well I’m hearing it that challenge or that this is another organization now they are partnering it seems with the businesses so there’s a relationship here with LinkedIn there’s a relationship with a couple other large organizations that have been mentioned and they have actual brick and mortar locations for these schools. Networks are assumes pre-built integrations with candid assessment providers. To me seems to be building out a platform that is telling the recruiters say the Holy Grail. It’s like the ultimate recruiter tool. From what I can see you’ve spent a long time in the recruiting space you know when you start getting into candidate assessments getting into candidate application areas which is now sort of more than the marketing and recruiting platform is this makes sense or a platform that is so focused on the recruiters there. Well you know what I’m seeing in the high end of the world is that there’s there’s a significant amount of money being invested in turning assessment from something that’s laborious frustrating that you can see the value but nobody will take an hour long assessment and take it seriously. You have to get the entire management structure of your company talking in the same way using the frameworks to make decisions. So what’s happening is that there cannot be 30 companies where what they’re trying to do is make this assessment happen faster and they’re using intelligence to make assessment happen faster and so on isomers for catching that trend and integrating you will pretty soon have a world where everybody who applies for a job gets assessed as almost the first step of that process. Now being a user is a separate thing so if I know all about your personality I don’t know anywhere where I can find out whether or not that actually is meaningful in your job. Assessments are always a mixture of science and art but that’s been part of the challenge with them unless they are highly validated which most of the larger ones have been highly validated as they must be if you’re using them from a recruiting perspective validate at least against the job requirements in a show that these are things you’re assessing for. I think that will be used on the job and that’s a little bit harder with things like personality traits or you know information that you’re looking for in the survey as we decide about the next generation of workforce like critical thinking skills. Yeah I don’t know. You know I’ve seen there’s great work going on out there in job simulations the kinds of assessment associated with duplicating the decision making environment of the job that’s really really interesting. So that’s what they’re talking about here. We’re talking about standard. Personality and sometimes skills hard skills assessment tools that you could dump into a single portfolio for a chair the review purposes. So I doubt that part of this process is insistence validating that what is being assessed is associated with performance on the job because that presumes a very complex relationship with the assessment firm to determine what’s relevant for the job profile. So there’s risks involved in it but I do think you’re right that we’re going to see more and more of it than Yeah yep yep it’s the new things so kind of talking about data and all the things that cause you think about all the assessment comes with someone’s information that they’re sharing about themselves and their personality. What do you think about this new legislation that’s putting put forth that is unlikely to go forward. We know that here in the United States but it’s a data breach or what they’re calling the data breach legislation which is aimed at the executives which could include the heads of H.R. as being held accountable with some possible jail time for their organizations getting a data breach of personal information and data. I think we’re going to see a lot of this sort bubbly news as we move our way into the next election. And there’s certainly a big hunger in the United States for reining in large corporations and for reining in the turn that’s taken in privacy. This isn’t going to go anywhere but it ought to. You know if some level of personal accountability isn’t reduced to the data and privacy thing. I don’t know how you get people to pay attention. It’s really brutally hard work to stay on top of securities. It’s dry it’s boring. It’s like being a first responder. It is dry and boring until it’s not getting those sorts of jobs right. Security depends on being excellent whether it’s dry and boring. It’s pretty easy for people to slack off in those in those areas and that’s where the breaches tend to come from. They come from stupid mistakes. Waking people up so that stupid mistakes making diminishes is a good idea. So there’s something here. It’s just wrong. Well really were. I mean this is exactly the conversation that I had actually yesterday with the audience that I was talking to about the new H.R. technologies role. You know it’s surprising that almost 25 percent of the market has Bring Your Own Device mobile technology agreements with their employees where they can connect to their network but they have no policy in place around that connection. On top of that we found that only about 50 percent of organizations in our research are doing any kind of deal factor multi factor authentication and for mid-market small organizations and even larger accusations only about 50 or 60 percent of them are do not have remote wipe capability on H.R. technology that those are the kind of things that are just basic fundamental data protection tools right. And lots of organizations don’t have in place on H.R. technology which is one of them the most widely available areas where you have personal information or data accessible to organizations. So it’s an ongoing issue I think for the space so real quickly we have a Google item next on the shows with two of this week and certainly lots to talk about we might pick it up next week as well. But the basic theme of the piece that you discovered which is that the cloud component of Google wants to go deeper into the pros. Their strategy is very interesting and worth understanding so they don’t really have products in the way the Oracle or as HP or IBM or ultimate would have that they do more. It’s more of an API business. And so as I understand them versus where and I probably have a little bit wrong. They sort of plug you in to one kind of data or one kind of servers like their job matching servers and get to know you because you’re plugged into the one little piece of technology and they show you where the other plugs are and how you can plug those other things into your processes. So they’re not thinking about coming as a forward workflow oriented approach provider who you would replace Oracle with Google. Instead they’re imagining that you’re a bunch of sockets in those sockets are created by your current enterprise level service provider and they can offer you accelerants to modular processes inside of that to some extent. So. It makes complete sense that I think that the living lifestyle. That’s I think a little bit different that we’re starting to see and I’d be interested in knowing that maybe this will be picking up nicely. Part of this conversation is not just about their applications but it’s also about their cloud infrastructure. So I feel like maybe what he was doing is saying we all we want you in our cloud but we’re okay if you bring anybody else into our cloud and then we’ll we’ll slot our applications in much more easier if you’re in our cloud. But everybody we’re happy to have everybody working and I’m not sure that’s what we hear as much in the other cloud application area. Does that make sense to you. Well yeah so I think we should tell you this is a new way of imagining enterprise functionality delivery. And so when I say plug it into your process what I really probably should be clearer about is whether you have this plug you could execute your process in our cloud and we want you to do more execution in our cloud but we’re happy to have it express in the face of somebody who might view themselves as virtual. That’s right. That resonate with you. That makes more sense and I think this is the new way we have to think about architectures right. Like there is no single entity. But there is this sort of amorphous cloud world that you’ve got you’ve got to sit somewhere basically like you have to have a does make a decision about which of the cloud environments you feel are most conducive to the way you want to integrate your applications and those integrations. Right. So I wonder if the decision is different at the operating level and the smaller you know workday and ultimate and a host of other people have slack immigrations because they’d rather be where people work than only human face. Maybe that same kind of principle is spreading out so that owning the interface isn’t the game owning the process owning the performance of the process even is the game. And that’s a way of talking about how Cloud processing volume increases. Fact I think the language gets really squirrelly here. You know I had a great conversation with people from Google but it was just like this trying to feel for the next level of the metaphor that describes something that is pretty powerful that is going on. It’s a powerful and it’s new. So it’s hard to describe something that is really new and just that we’re wrapping our heads around it right. So I’m not surprised it’s a little bit difficult to describe. I think you know in a few years that they’ll have names for all these things that will make a lot more sense than what we had today and we’ll probably still be talking about it John so that’s I hope where we’re at. Yup. So what a great conversation. Thank you so much for doing this. And we’ll be back here same time next week. You’ve been listening to HR Tech Weekly, one step closer with Stacey Harris and John Sumser, see you soon, thanks for listening in.